Jr. Salazar says his Bomb Azz Tacos brings a “new style of Mexican food” to Long Beach. What exactly does that mean? “We put a twist to the original street taco,” he explains. 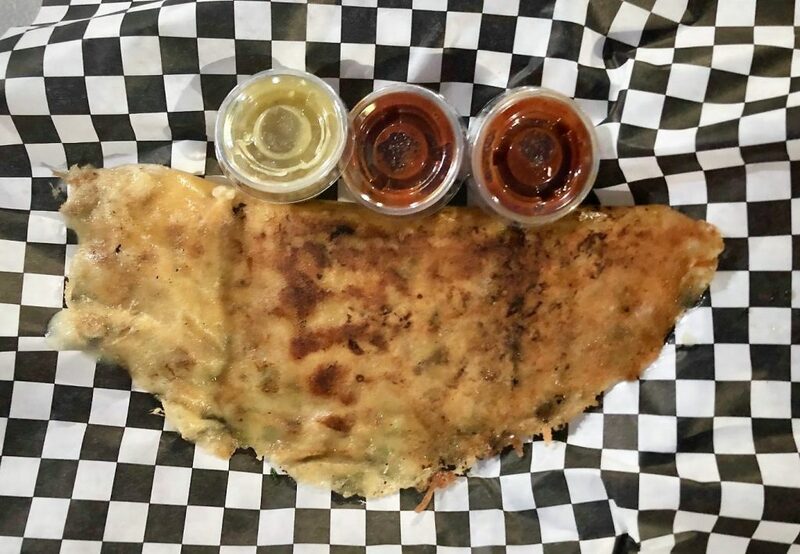 “And we are known for our Keto Cheese Taco and our WaffleDilla,” two hybrid items he claims are unique to his food truck. The Keto Cheese Taco is a combination of meat or soy chorizo with fresh cilantro, thick shards of grilled onions, crema and smooth guacamole in a “cheese wrap,” a big ol’ slab of melted cheese folded in half. Golden, crispy cheese forms ruffles along the edges, but the inside remains gooey, melted velvet. The dish may be touted as a taco, but this is definitely a knife-and-fork situation. On the opposite end of the carbohydrate spectrum is the WaffleDilla, which is exactly what its name suggests. 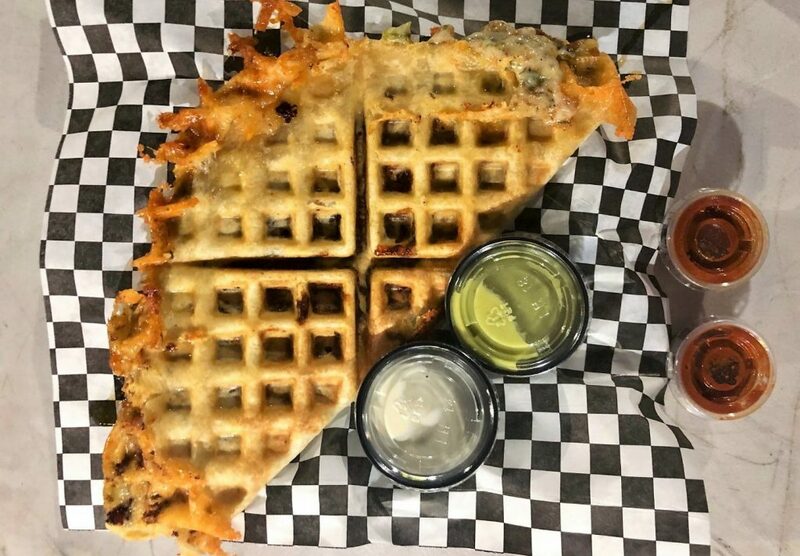 A massive flour tortilla is stuffed with cheese, grilled onions, cilantro, more cheese and your choice of protein, all of which is forced into a red-hot waffle iron, resulting in a checkerboard of crackling edges and crunchy squares. It comes with sides of sour cream and guac sauce for slathering. Perhaps Bomb Azz will consider a brunch service because we need more WaffleDillas in our life. Both these modified items on the otherwise fairly traditional menu are indulgent, calorie-laden, drunk-eating bombs of cheese and meat. 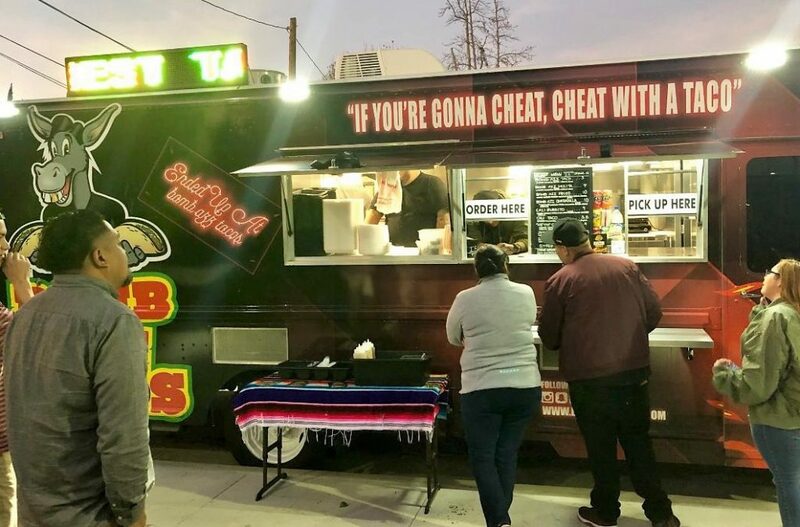 But as the logo emblazoned across the top of the truck says, “If You’re Gonna Cheat, Cheat With a Taco.” Unless you’re keto; then you’re fine. The street tacos, referred to here as Bomb Azz Tacos, are much lighter fare. They come one per order, with tortillas that are dense, pliable, deep yellow and resistant to the typical mid-bite collapse. The standard onions-cilantro-guac combo accompanies your choice of proteins: carne asada (chopped so fine it nearly resembles ground beef), chicken, al pastor (slow-simmered, sweet-spicy), soy chorizo, regular chorizo or carnitas. Bomb Azz Tacos, 1824 E. Broadway, Long Beach, (562) 274-6954.